Steve started Djing in 1985 and signed his first resident contract in 1989 for the legendary “Flying Dutchman”/LU (the german music magazine SPEX voted it twice into the TopTen of best clubs worldwide) where he staid for 12 years. 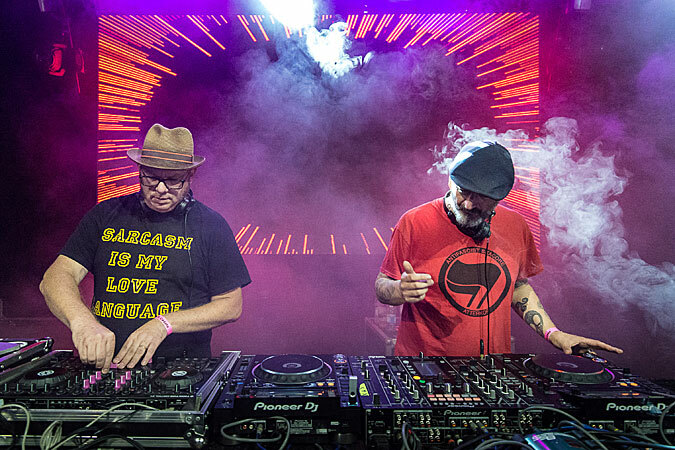 During his residency he introduced the crowd to the new sounds of the 90ies, such as TripHop, BigBeat, Indie... With DR.Gonzo he built up a DJ Collective called “Anaïs Soundsystem”, organizing Reggae Nights, Concerts, Exhibitions, Raves & Underground After-parties in the woods of Luxembourg. Projects: Steve RIOT Plemm Plemm Soundsystem in the past DJ of Gospel Emcee Actually he started as an Alternative Rock DJ, just to underline his variety. Resident in the legendary Flying Dutchman (voted twice into the Top Ten of best international clubs in germans music magazine SPEX), he spreads the sound of the future into Luxembourg’s Nightlife, inviting new talents, local heroes and international guests to have great nights and lots of fun with all that electronic stuff! In 1992 Steve R.I.O.T. & Dr.Gonzo, formed a DJcollective named ANAISSoundsystem. Both played in every known club in Luxembourg. Their main style was Reggae, Ragga, Dub... but they started also to organize concerts, raves ...and were always on a journey onto sound. From 1996 to 2000 they played as residents for Luxembourgs biggest electronic festival, called e-Lake. After 8 successful years ANAISSoundsystem split. After this times of change, dr.gonZo began to built up his reputation as an open minded electronic dj and played in many national and international clubs. Owner of Club Zero (till 2003), knowledge in music and 20 years experience behind the turntables, he creates down to the present days the medicine for your ears :That's what makes dr.gonZo a popular dj in Luxembourg and surrounding.